Deliver opulent gaiety to the ones close to your heart by gifting them this Wondrous Splendor Diwali Hamper and make their fiesta of lights a very fetching time. 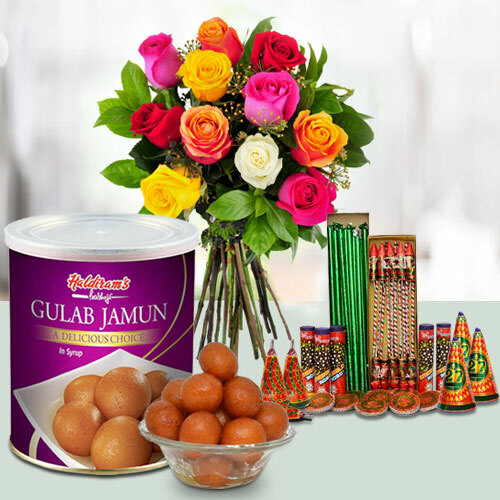 This winsome Collection exhibits 1 kg Gulab Jamun, Crackers and a Bunch of 10 Mixed Roses. Note: Types of Fire Crackers depend upon their availability. Flowers Delivery Nawashahar, Send sweets Srinagar, Wedding Cake Vadodara, Diwali Mithai Rajamundry, Send Flowers and Gifts to Tiruvananthapuram, Online Shop Thiruvalla, Flower to Udupi, New Year Flowers Kolhapur , Fresh Fruits Thiruvalla, Send Gift Bhopal, Dry Fruits to Barrackpore, Birthday Delivery Proddutur, Sending to Tuticorin, Flower shop Rishikesh, Karur Online Cake Delivery.